A love of wildlife and art brought together a group of over 20 students on Friday, Nov. 11 in the ecology lab on campus. The lab was filled with stuffed birds, leaf specimens, and sketching materials for artists of every level to use and enjoy. 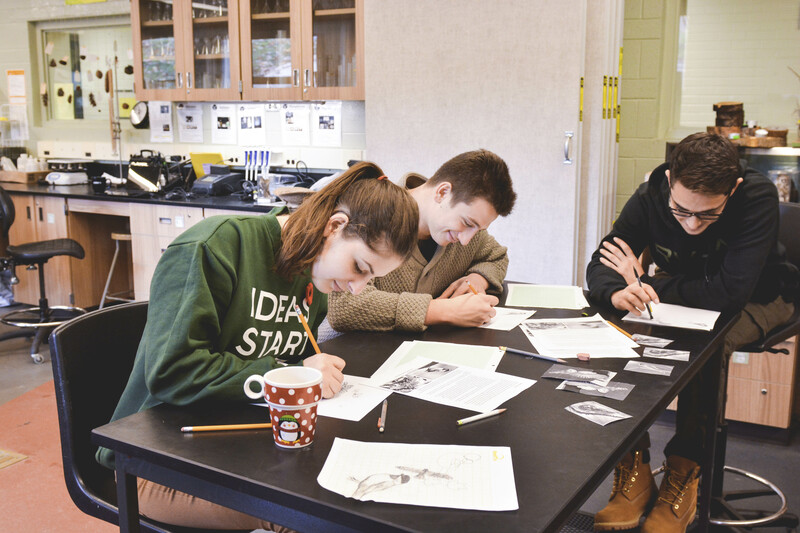 The workshop was led by Megan Wilcox, a student in the ERS program as well as a published nature artist. She began the workshop by showing off her impressive portfolio of paintings and sketches that have been printed in textbooks, displayed in museums, and commissioned for personal collectors. Students marvelled at her paintings of owls on birch bark, mushrooms sketched in pen that looked like you could pluck them off the page, and nature scenes so beautiful and serene that it was no surprise to anyone the young artist is already published. Students were first instructed on the core concepts of nature sketching. “Nature sketching helps you remember little details and show them to others, as well as heighten your observation skills and memory,” explained Wilcox. Students were given simple instructions on how to create a grid on their paper to make the drawing process easier. 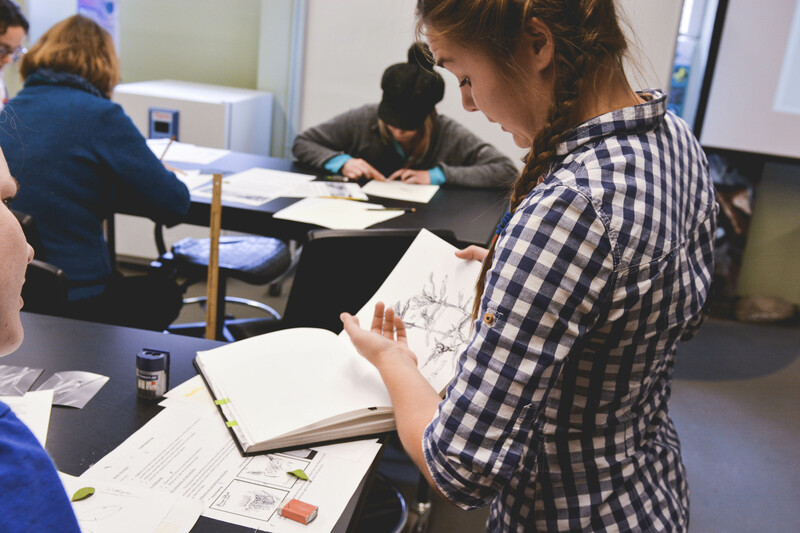 The lab was serene as students focused on their sketches of chickadees and wintergreen berries. The scratching of pencils and frustrated sighs of erasers were all that could be heard in between quick sketch lessons. Wilcox toured the room as students applied their skills, and offered encouragement and easy tips to improve everyone’s sketches. The workshop lead students through drawing techniques like cross-hatching, stippling, and even scribbling. Attendees watched in awe as Wilcox demonstrated the power of scribbling by creating a perfect raccoon ear on the whiteboard out of seemingly nothing but a bunch of messy lines. 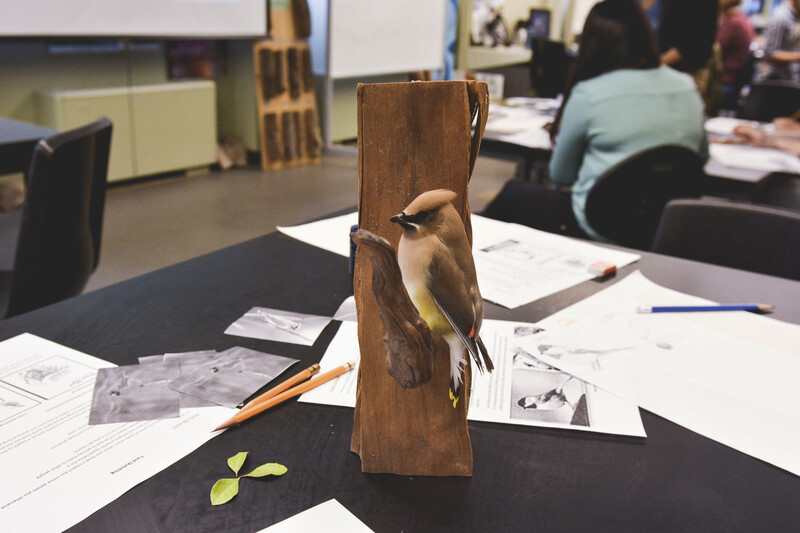 Pictures of various birds and plants were available to practice sketching, as well as an incredible taxidermied cedar waxwing bird specimen. Students were encouraged to take a close look at the delicate detail on the forest bird and for many it was the first time they had seen a bird so close. 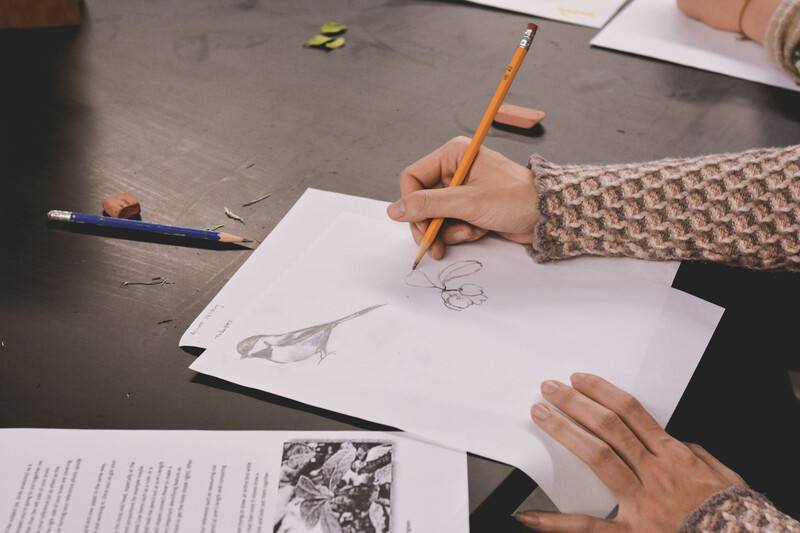 As students employed their patience and drew and redrew beaks and feathers, Wilcox provided general tips for working with nature from her own experience as a bird watcher and ERS student. As the workshop came to a close, students gushed over their sketches, as everyone who attended saw at least a minor improvement in their personal art skills. Attendees gathered to admire Wilcox’s work. Some pieces were painted on tree bark and others framed, but all were gorgeous and intricate. Overall, students at the workshop enjoyed a very peaceful two hours with quiet encouragement and relaxed sketching. Everyone was at different skill levels and so the pressure was low. No one had to fret over producing Robert Bateman-level drawings. The ecology lab at UW frequently puts on unique workshops, open to all students and designed to celebrate and encourage love for the ecological world around us.